Summer 2018; we are ready to ROLL!! What the What? looks like MLRC log rolling is the new stuff! Come be a part of the action on June 10th at LynLake Brewery during Lyndale Open Streets! Lots going on behind the scenes at MLRC. 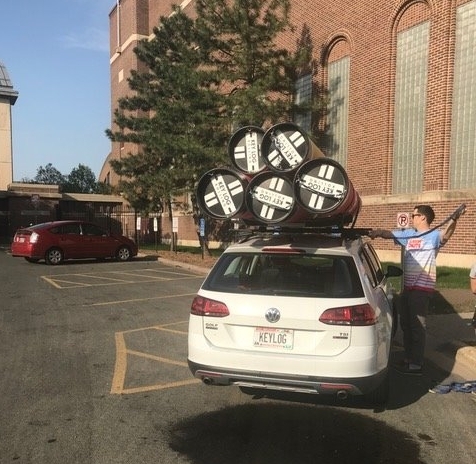 We are working hard on building our club for the future and in the meantime, the logs are out of the Cooke10 pool at the UofMN and are traveling to their summer beach homes. Punch Cards! Now, you can flex your roll in a non-committal, pay per use, punch card sort of way. In lieu of buying a summer pass for the whole season, you can choose to roll on whichever evenings you want with our punch card pass. You must be able log roll independently and you have had some beginning log rolling instruction prior to buying a punch card. Adults will have their adults-only rolling on Monday evenings in Roseville! What? they roll in Roseville? yes! The City of Roseville is excited to bring MLRC log rolling to the shores of Lake Johanna. Specifically: Arden Hills Beach Park 1735-1761 Lake Johanna Blvd, Arden Hills, MN 55112, located at Tony Schmidt Regional Park. If you have signed up for the 2018 Summer Pass or or have purchased the new Punch Card and you are an adult, we'll see you in Roseville on Mondays from 6 - 7:30. Kids will be rolling on the popular and relaxing Sunday Evenings from 6 - 7:30 at East Cedar Lake Beach . Though the youth training will be "open rolling" format, one of our own teenagers and Key Log Rolling certified instructors will be paid to get the logs in and out of the lake and make sure everyone is happily engaging in cooperative log rolling training and sharing equipment nicely. Our popular one-off 30 minute beginning lessons! Taught by competitive log rollers and Key Log Rolling certified instructors, these 30 minute beginner lessons are open to all ages and are taught in small classes sizes of up to 4. They offer a personalized introduction to log rolling. Classes will be taught on Sunday evenings in the 5 o'clock pm hour at East Cedar Lake Beach. Sign up here. Take 3, 30 minute classes and you are eligible to join the club and sign up for a Summer Pass or a Punch Card. These classes would be a fun way for a family to try the growing and popular sport of log rolling together in a beautiful Minneapolis lake. Buh Bye Winter! Hello Summer of Rolling! Older PostMLRC Announces Indoor Season: Open House and Session One Registration is open!